I was a mascot at the footy as the Gold Coast's only superhero, Titus. Being eaten by a shark. I would definitely hate to be eaten by shark. Being eaten by people comes a close second. Simple, fun and keep the reader guessing. Is that ten? Creative, mysterious, mischievous, exciting, compassionate. 6. What book character would you be, and why? Easy question - Batman. I'd love to be the Dark Knight because he beats up bad guys, wears a cool costume and drives the meanest car in town. And he has a butler. I'd go back to 1960, pick up a guitar and join The Beatles. Then it would be John, Paul, George and Dave! My mum. She taught me the importance of hard work and respect. I only started writing seriously after I had children. I'm very creative and I wanted to share some of my crazy stories with crazy kids. "Do you want toasted sandwiches for dinner?" 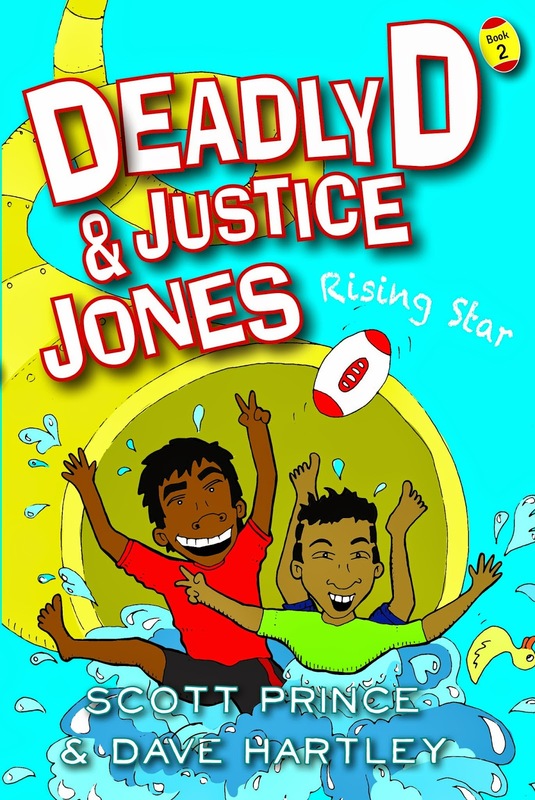 Deadly D and Justice Jones: Rising Star. The joke on page 168 never gets old! Dave Hartley is the co-author (with Scott Prince) and illustrator of the Deadly D and Justice Jones junior fiction series. His latest book, Deadly D and Justice Jones: Rising Star was published by Magabala Books in September 2014. You can find out more about David at the Magabala website.